" As an event planner, I have used a few different networking companies for our annual user conference. This year, we used Ignite and it was a great change that sparked a whole new energy to our networking event. The tool was easy to use, the pricing is right in line with the budget and our 100 participants walked away with an average of 30 new connections to take away and follow up with. The approach is simple and customizable to your needs, comfortable and no pressure for the attendees and a very smooth process. I would recommend this tool to any event manager and planner to try at least once - then, you’ll be hooked! " " As an event planner and user of Ignite Speed Networking it takes out all of the stress and guesswork of making sure all of our attendees get the most out of the networking event. It provides a fun, relaxed, and truly effective way of meeting the most people in the short amount of time. Best of all, Ignite Speed Networking customer service is top notch which is hard to find these days. " " The Ignite Speed Networking session was a unique way to meet our goals--which was to allow vendors to have access to the group they are trying to reach. The session was fun and the timed sequences allowed everyone to enjoy the same exposure. Would gladly do it again. " " I have attended several of the Breakfast Break Speed Networking sessions sponsored by the Richmond Chamber. I have found them to be an excellent way to present information on our products and services in an informal and relaxed, yet well coordinated, manner. Coming out of every session, I have always had various leads to follow up. In addition, Ignite sends out the contact information of the individuals at each table that allows additional follow up. It is a wonderful way to meet a variety of people from numerous industries in the greater Richmond area. Thanks. " " The Ignite speed networking event was great! I have been to quite a few networking events now, and I believe that this has been one of the most beneficial so far....Not only were we able to talk more openly, but we were given the chance to answer questions people had, then and there. I made contact with over 50 people in only one hour, and was even able to set up a couple group outings for our season! I am very much looking forward to future Ignite events, and highly recommend them to all of my colleagues. " " I recommend using Ignite SN all day long! " "As someone who works from referrals and personal relationships, quality events meeting new people is essential for me to survive. I can truly say that I have always come out of one of your events with a true new contact. Often times at traditional events, when people are waiting for their turn and trying to overcome their fear of speaking in front of a large group I find that a lot of people are not focused on what is going on until it is their turn. Sitting at a table with 8 to 10 people helps keep everyone involved in the conversation and allows people you really want to connect with the opportunity to know that right away....My only complaint is that you don't have one of these going on every week. Thank you for helping me build a business!" "I attend between twenty and thirty networking events a year to build my customer base. One problem in building a customer base and getting referrals is time to do it. Speed networking addresses that need. Another issue at networking events is the chance to meet most of the people there. Ignite Speed Networking now addresses that issue. I always come away from their events with positive results. Thank you for this innovative approach." "I’ve attended three Ignite Speed Networking sessions and have met so many quality business people I can barely keep up with the follow-up! The Ignite process makes it easy to network and it always comes off perfectly." 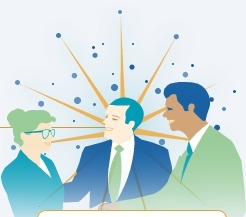 "Ignite Speed Networking allows you multiple introductions in a minimal amount of time. While brief, the introductions go a long way in helping create contacts to resources or professionals you may have been looking for. I would recommend Ignite to any professional or organization looking to increase networking visibility." "I’ve been speed networking multiple times per month for the past year and a half and nobody came close to being as efficient as your system. Value added indeed…now let’s just hope your potential customers see that." "It was a great event! I look forward to attending more." "I participated in the Chesterfield Chamber event last year and made some great contacts. Your system is fun and so well organized that it makes it time well invested for a small business owner." "This was our first time using Ignite Speed Networking. Our event attendees’ comments were positive, and they felt that it made networking painless and constructive." "The Speed Networking program developed by Ignite is long overdue! It allowed a room full of strangers to become acquainted, and made for a smooth transitioning follow up. This is the future of effective networking." " I found it to be exhilirating. The process of a one-minute descriptive pitch of your business and capabilities was very effective in forcing all attendees to be concise, to listen and then to discuss, if time remained, before going to the next assigned table. The result was a quick and effective networking opportunity that kept everybody moving and engaged. It was also a fun and upbeat way to begin the Fair’s half-day program. Bottom line for Donahue Communications: visibility, awareness and meaningful conversations among a far larger group of business people than I would otherwise have been able to achieve. " "I think it was the best networking session I have ever attended." Meyer, Goergen & Marrs, P.C. "I find it very difficult to break my production schedule and commit ample time for the development of vital business relationships. The Ignite Speed Networking events that I have attended have gone a long way towards solving this problem. I am able to meet a multitude of contacts in a variety of businesses in a relatively short period of time and nuture those that are mutually beneficial. This is the best face-to-face marketing tool that I have encountered." " I've been in sales for many years and networking is always a challenge. I'm an outgoing guy and it is still intimidating to just go up to someone and start talking. Plus, once you meet the person, you feel obligated to chat with them, even though you may find out immediately that he/she would not be a center of influence and you'd rather move on. What's great about Ignite is that I can meet quickly almost everyone there. I get their cards and I get to hear where they're from and what they do. I can make notes on their cards to follow up if I think we can benefit from a future meeting, or I can discard their cards after the meeting if I see no benefit. I can meet dozens of contacts in an hour or so. It is quick, effective, and very easy because Ignite sets up the contacting for me and allows me also to disconnect quickly from those I'm not interested in. I truly believe Ignite is a better mousetrap in the networking world. " "I got a lead on a potential house addition and renovation. As a builder, one lead is a great result. So thank you for the opportunity. I also met a potential settlement service representative along with at least 3 other referrals. So I’d categorize it as a very productive meeting." "At a previous Chamber, we held several "speed networking" events and tried to work out the rotations. University professors worked on the project but were never able to get the seating right. Ignite is ingenious and has become a "must attend" event at the Chesterfield County Chamber." "Ignite Speed Networking has created great excitement as one of our monthly networking events. Everyone raves at the flow, the increased and focused attention of the participants and the multiple opportunities to make more effective connections. In a room with over 100 participants, it provides an organized and high energy networking event that people want to continue to come back to." "Prior to Ignite Speed Networking, I was happy if I met 2-3 new people at a networking event - and thrilled if I walked away understanding what they did, who they were looking to meet, and whether or not we might be able to work together. I was first introduced to Speed Networking at a local Chamber event and now I'm spoiled - I was able to meet over 2/3rds of the people in the room and walked away with 7 good contacts. When I became Programs Chair for my NAWBO chapter I made sure that Ignite Speed Networking was our first event of the year. Everyone in attendance raved about the experience and some strong bonds were established. I anticipate Ignite Speed Networking becoming an annual tradition for the chapter, now. Thanks for helping my business grow - and for making me look great with my peers!" "2 years ago the Greater Richmond Chamber wanted to launch a highly effective speed networking function to revamp a current event that had 60 member participants. With the help or Pendulum we were able to launch this new Speed Networking event in less than 2 months. The event now generates over 100 members and it has allowed those participants to network effectively and quickly. The feedback from our membership has been very positive and we thank Mike and pendulum for not only creating a successful event but for doing it in such a professional and effective manner. Thank you Pendulum! " "In today's technology infused global economy, business people are more hurried and harried than ever before, but their success is still built on connections and relationships. Ignite Speed Networking creates a unique environment for professionals to network. It is not only the latest craze in corporate schmoozing, Ignite has provided a relevant and valuable spark for our members to connect in a meaningful way." "As the Project Team for N.E.W. (Network of Enterprising Women), I was responsible for planning and organizing our annual event Woman 2 Woman. As a networking association, we have this event every year for the sole purpose of intense networking. IgniteSpeed Networking helped me tremendously. Our day was very successful and all attendees were very happy. I would recommend Ignite Speed Networking to everyone!" "Thank you so much. I really had a good time and made some great contacts." "Ignite Speed Networking took our already anticipated networking events from routine and casual to outrageously fun and productive!! We received more feedback for this networking meeting that we had from any other networking event we had hosted. It continues to increase our membership and bring members back. Thanks for making me look so good as the program director!" "Last year we had the pleasure of hosting an Ignite Speed Networking session for our members of the Central Virginia Chapter, Women’s Transportation Seminar. Since we are a new Chapter for this organization and the only chapter in Virginia this provided an exceptional opportunity for our members to learn who some of the other members were and what opportunities were available at other transportation businesses in our area. The transportation industry offers a variety of employment opportunities including planners, engineers, environmentalist and communications as well as careers in highways, rail, transit and airlines so having the opportunity to network using Ignite's creative and innovative approach worked exceptionally well for our diverse group. Our membership was very impressed and has requested that we try to include another session on our program schedule for 2008." "The Ignite Speed Networking event at the Chamber was such a fantastic event…I especially liked the way we were sorted into our groups. The software used was seamless and made the process so easy…what a great piece of technology to add to the success of this well attended event." "As a member of the Greater Richmond Chamber, I have had the opportunity to participate in a speed networking event made possible by Ignite. I want to thank you for propelling "networking" to the next level with your program. I made great, solid connections, had great fun in moving around the room and enjoyed every minute of the event." "The very first Chamber event that I attended was an Ignite Speed Networking event last Fall. Needless to say, I was very impressed with the efficiency of the event and the fact that your software allowed me to meet the greatest amount of new contacts in the shortest period of time. I wish every networking event could be this impactful!" "I've really enjoyed attending the speed networking events. It's been a great source for making some real contacts, they are fast paced and fun! I always enjoy attending!" "The GRCC Speed Networking event is my favorite Chamber event of the month! One thing that makes it so efficient is the adhesive instruction card that Ignite Speed Networking provides. This instruction card enables me to know exactly what table to go to for networking with other professionals. Without the Ignite instruction card, the meeting would be completely out of control and confusing for all. With the Ignite instruction card, the meeting leader (Betsy Mangum the Magnificent) is able to seamlessly, efficiently, and effectively manage the Speed Networking of well over 100 people. Thank you Ignite Speed Networking for being a main reason why I attend the Speed Networking event every month!" "The benefits of the speed networking provides an exciting opportunity to engage our business and services up front close and personal, which in turn provides big results for my business in model bookings and new agency promotions. YES, I love speed networking! " "I have attended the Chamber's Breakfast Breaks for many years and I must say that I have met some truly amazing people. The group speed networking is an "energizing" way to meet many people in the room. I enjoy the fellowship and I really get inspired when I attend these events. To the GRCC I say...Keep up the good work!" "I go into an Ignite speed networking event knowing that the goal is to get a quick snapshot of dozens of other businesses. Then, I do my due diligence afterwards by connecting with and fostering relationships with those people who are right fits for me -- people I would have never met without the benefit of speed networking." "It is a fun way to meet new contacts and get new business. We should do it some evening and stay longer!" "This is the future of effective networking."